Question: My wife and I recently divorced. Is it still possible to sponsor her? Answer: UAE law does not allow a man to provide visa sponsorship for a former wife. She will need to apply for a visa to remain in the country. Recently, the General Directorate and Residency of Foreigners Affairs issued a rule allowing divorced women to apply for a visa extension of one year after getting divorced. An application should be submitted to the directorate and within 48 hours the authority may extend the visa without sponsorship. The visa extension may allow divorced women to seek employment in the country and to manage the sponsorship, if she wishes to stay in the UAE. If the two of you have children, you will be obliged to keep sponsoring them. Question: My husband and I are French citizens with residency in the UAE. Can we pursue separation (khula) in the UAE? Answer: UAE courts have jurisdiction over personal status cases for citizens and residents. Because you are residents of the UAE, you may apply to divorce here. The process for filing divorce is extensive, but simple. It begins with opening a file before the Moral and Family Guidance Committee - which is present in courts in every emirate. After you submit the application, the counsellor invites the parties for an amicable settlement or reconciliation. At this meeting, the couple, without the presence of legal representatives, discuss their issues in the marriage in an attempt to resolve the matter. The committee tries to reach a settlement, but if it cannot, the case will be referred to the Court of First Instance. 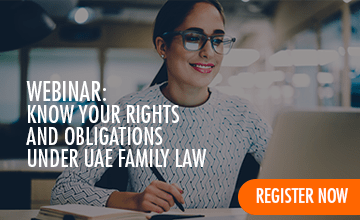 Non-Muslim residents can choose to have their case considered under UAE law or ask the court to apply the laws of their home country. In addition, parties may obtain a divorce decree by mutual consent, followed by a settlement agreement in accordance with the Personal Status Law. Both sides can open the file before a settlement committee and accordingly can register the settlement before the Personal Status Court. The process of mutual-consented divorce is circumscribed and less time consuming. The documents required in both cases are the original marriage certificate and original Emirates ID. Both documents must be legally attested by the public notary and Ministry of Foreign Affairs if they were issued in another country.